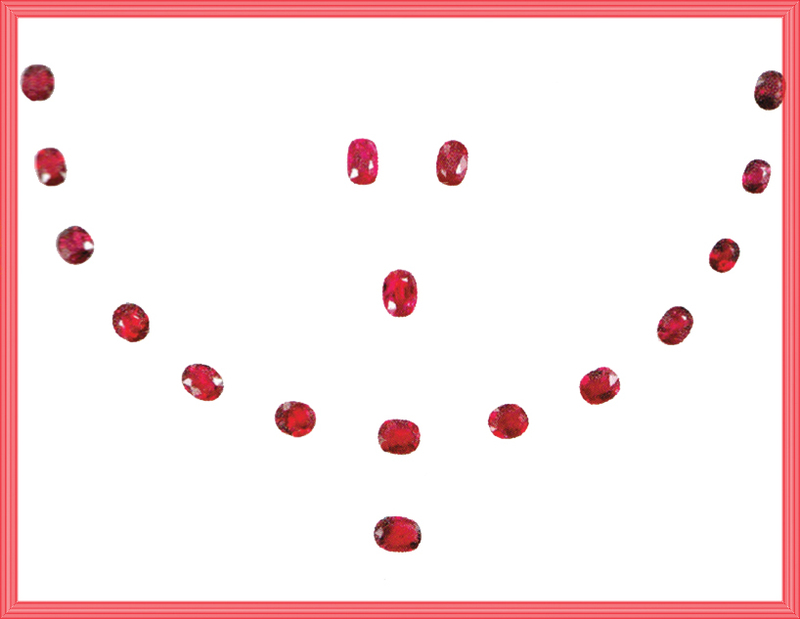 ​One of the world’s most prominent centers for gems and jewelry is Thailand. Its rich history can be traced back hundreds of years when abundant natural resources, especially ruby and sapphire, were found in many areas of the nation. Its long tradition of fine craftsmanship has been passed down from generation to generation. Today, combining its renowned production and design skills with cutting-edge technology and internationally recognized testing facilities, Thailand has evolved over the last few decades into a major player on the global gems and jewelry stage. Thailand is a major global hub for colored gemstones. Thailand is the largest exporter of silver jewelry and its many manufacturers offer a wide variety of designs, from the simple to the spectacular as seen in this gemstone, and gold-plated necklace by the designer brand Dhevan Dara. 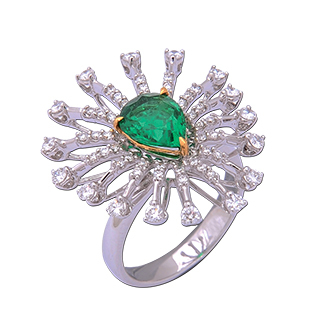 Emerald, diamond and gold ring from Sigi Group by Lume Creations. 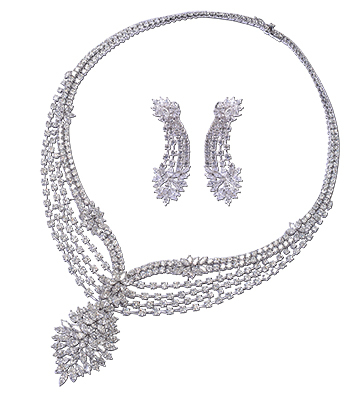 An emerald and diamond necklace with matching earrings from Beauty Gems, a very prominent family-owned brand with nearly half a century of traditional skills and craftsmanship that have been passed down from generation to generation. Silver and enamel necklace by F & R Jewellery. Silver and gemstone parure by JLB Mfg. Diamond and gold necklace and earrings by Mahallati. Silver, mother-of-pearl and resin cuff by Monplaisir. 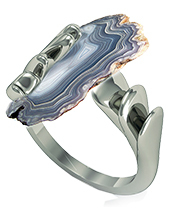 A winner in GIT’s Design Contest for young designers is this silver and agate ring by Chatmansee Taesoontornpairoh. A set of Mozambique rubies (24.25 carats) that sold for US$60,000 at the Gems, Jewelry and Luxury Goods Auction, Gemopolis Industrial Estate, during the BGJF. Burmese blue sapphire (15.10 carats) and diamond ring that sold for US$467,200. at the Gems, Jewelry and Luxury Goods Auction, Gemopolis Industrial Estate, during the BGJF. ​Thailand's gems and jewelry sector has systematically developed from a cottage industry to a large-scale and export-oriented commerce, generating nearly US$10 billion in exports and creating jobs for millions of people. The industry is made up of three segments: gemstone heating, cutting and polishing; jewelry design, casting, setting, polishing, quality control, and packaging; and sales in domestic and international markets. Most of the players in this segment are small- and medium-sized enterprises. Representing more than a third of Thailand’s gem and jewelry exports, fine jewelry creation in Thailand relies on skilled craftsmanship, original eye-catching designs and modern technology to produce jewelry competitive in international markets. And, a significant share of this fine jewelry is third-party production that Thai manufacturers carry out for many foreign brands, including a number of global luxury brands. These include exquisite gold, diamond and gemstone pieces. Many of these production facilities are located in tax-free zones, such as Gemopolis, on the outskirts of Bangkok. Here, foreign companies benefit from a strong infrastructure, easy access to raw material suppliers and a skilled workforce offering high-quality craftsmanship. One such company with a global reach, Pandora, began producing in Thailand in 1989. In 2003 it moved to Gemopolis and in 2005, opened its first large-scale, four-story, fully-owned facility. In 2008, a second manufacturing facility was opened in the same area, followed by other facilities. Its more than 10,000 employees are responsible for producing thousands of pieces an hour. Thailand is also the largest exporter of silver jewelry in the world. The country’s silver makers follow ancient traditions to create a vast array of fine jewelry as well as costume jewelry and objets d’art. Some are created by artisans around Thailand who create intricate designs, while others are the products of modern manufacturing. Historically, Thailand has been a gemstone sourcing country, known primarily for the deep red rubies mined in the Chanthaburi region and the blue sapphires from around Kanchanaburi. This activity gave rise to a major cutting and polishing industry to turn these rough stones into exquisite gems. The Thais also developed a range of heating and other processes to further enhance the beauty of the nation’s gems. Today, with most of gem deposits depleted, Thailand continues to be a global gemstone hub by importing raw materials for its cutting and treatment infrastructure. The nation’s exemption of the 7-percent VAT for the importation of rough gems ensures a steady supply from around the world. Reflecting Thailand’s importance in the global industry, thousands of international buyers and traders gather twice a year, in February and September, at the Bangkok Gems & Jewelry Fair (BGJF), a showcase for the industry that is ranked fifth in the world. Despite the recent terrorist attacks in Bangkok and the global economic slowdown, the BGJF still registered good visitor turnout, according to fair officials, with some 11,000 people entering the show on the first day, who came to see the wares of some 2500 exhibitors. While a showcase for Thai gems and jewelry, the show also featured a wide range of international exhibitors from dozens of countries around the world. A prime indicator of the importance of the gem and jewelry industry to the economy of Thailand was the presence of the nation’s Prime Minister, H.E. General Prayuth Chan-ocha, who spoke at the opening ceremony of the of the BGJF. Organized by the Gems, Jewelry and Precious Metal Confederation of Thailand (GJPCT) and the Thai Gem and Jewelry Traders Association (TGJTA), with the cooperation of the Ministry of Commerce and the Department of International Trade Promotion, the 56th Bangkok Gems & Jewelry Fair (BGJF) took place September 10 to 14, 2015 in Bangkok under the theme, Thailand: The AEC Gems & Jewelry Capital. “Thailand is among the top ten exporters of gems and jewelry products in the world,” stated Somchai Phornchindarak, President of the GJPCT. “In the six months from January to June 2015, the nation has earned US$5.334 billion from these products.” So, what was the breakdown of products at the BGJF? Because Thailand is a global hub for colored stones, it was no surprise that this was the largest category (nearly 30 percent) at the show, with silver jewelry a close second at just under 25 percent—again understandable since Thailand is the world’s largest exporter of silver jewelry. Gold, pearls, and fine diamonds made up a little less than 25 percent, while the International Pavilion accounted for 16 percent of exhibitors. Equipment, packaging, synthetic stones and costume jewelry rounded out the total. Unlocking the tax barrier was a definite incentive for both exhibitors and visitors at this edition. The elimination of the 20-percent duty effectively made the BGJF a Duty-Free zone. Another tax incentive was the Zero VAT, which is the continued exemption of the seven-percent value added tax for all imports of rough gems stones and raw materials into Thailand for manufacturing. One of the most important exhibitions at this edition of the BGJF was the special pavilion paying tribute to H.R.H. Princess Maha Chakri Sirindhorn on the auspicious occasion of her 60th birthday. Held at the Design Pavilion, the inaugural ceremony featured a traditional Thai dance performed on stage for the guests, who could then look at the many jewels inspired or created under the patronage of the beloved Royal Princess. Another highlight of the show was a new event, the Gems, Jewelry and Luxury Goods Auction, Gemopolis Industrial Estate, in support of GJPCT and the TGJTA. Numerous bidders gathered to buy precious items at good prices. Among the 120 items auctioned off was a set of 17 un-mounted oval-shaped Mozambique rubies (unheated) with an AIGS certificate and a total weight of 24.25 carats that sold for US$60,000. 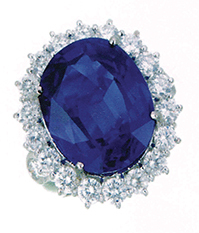 A remarkable 15.10-carat oval-shaped AIGS-certified Burmese blue sapphire set with brilliant diamonds in an 18K white gold setting went for US$467,200. “It was the first international auction at the BGJF and it was very successful. We saw bidders from Japan, China, Sri Lanka, Hong Kong and those from the West,” said Phornchindarak, adding that the auction will become a regular event with more products. Another successful feature of the BGJF was the Online Sourcing Project with Business Matching Service to facilitate contacts between buyers and sellers. “This service is proving more and more popular since it enables buyers to locate specific suppliers in the fastest and most convenient manner,” explained Damrongsakul. The topic on many minds at the show was related to the upcoming formation of the ASEAN Economic Community (AEC), which officially begins at the end of 2015, and is comprised of Brunei, Cambodia, Indonesia, Laos, Malaysia, Myanmar, the Philippines, Singapore, Thailand and Vietnam. Because of the strength of its gem and jewelry, Thailand is well positioned to benefit from this economic union. “The AEC will be a new market of 600 million people with a very high capacity for the regional gems and jewelry industry,” commented Suttipong Damrongsakul, CEO of the BGJF. He added that this market would pave the way for sales in Europe and the United States, and expressed confidence that, as part of the AEC, the BGJF would become a very effective gateway to the world. One of the major strengths of Thailand is that it is the world’s most recognized manufacturing base for fine gemstones and jewelry. Thai craftsmen have been known for centuries as remarkable creators of bold and beautiful pieces and, today, these beautiful creations are known by the name of Ploi Thai. Representing Thailand’s country brand for jewelry design, Ploi Thai epitomizes high quality and diversified fine jewelry set with gemstones cut, polished and produced in Thailand. These outstanding Ploi Thai designs, offering a wide range of diversity and versatility, were featured at the show, both in gold and in silver, with some featured on these pages. The Gem and Jewelry Institute of Thailand (GIT), is among the world’s leading gemological laboratories. Under the directorship of Professor Pornsawat Wathanakul, the CIBJO-registered laboratory (officially accredited by the World Jewellery Confederation since May 2000) has highly experienced gemologists and is equipped with the world's most advanced instruments. The GIT is also a member of the Laboratory Manual Harmonization Committee (LMHC), made up of the world’s seven leading gem laboratories. Aside from its lab testing services, the GIT also provides precious metals assays, laser inscription, educational courses, jewelry design, marketing and gemstone conferences, as well as other gem and jewelry related services. This year, its annual Design Award attracted a variety of talented students who created pieces evoking the theme Kaleidoscopic: Design Illusions behind the Lens. During the biannual BGJF events, the GIT offers an onsite laboratory for buyers wanting to have their prospective gemstone purchases analyzed and authenticated. 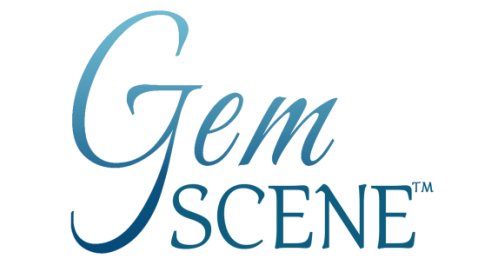 “We provide this service so that buyers can have an extra measure of confidence when considering purchasing gemstones at the show. Of course, we also offer a wide range of services at the GIT lab in Bangkok all year round,” explained Wathanakul. Despite global economic conditions, feedback from buyers who came to visit the BGJF was positive. “I have come here for twelve years. I like the show. It’s a very easy show to work. It’s easy to get in and talk to the manufacturers and the gem dealers that I want to see, versus the Hong Kong show, the Las Vegas show or the Brazil show,” stated Bruce Bucky, buyer from Hawaii, USA. “I have been to the show many times and I have always enjoyed it. I feel very safe here. I recommend this place to everyone. It’s nice and friendly,” commented Marian Goldsmith, buyer from Australia. “It is the first time I have come here. I can find a variety of stones. We met some suppliers who don’t export because they have small companies, so it is nice that the exhibition gives companies like them the opportunity to exhibit and for us, international buyers, to meet them,” said Maya and Zeenat Mukhi, buyers from Lebanon. “The fair is very nice. Lots of various pieces you can choose from. Depending on what you are looking for, you always find something here. I look for finished goods. They are not very expensive. Everybody can buy something.” Ms. Eric Tucholski, buyer from Canada. “I have come here many times. I buy gold and silver. I like the fair. It is very nice for business. And people are nice.” Ms. Jocelyne Mouton, buyer from France. A show-stopping necklace and earrings in gold, emeralds, and diamonds by Pranda, a pioneering manufacturer in the Thai jewelry industry and a global entity itself, with a wide variety of brands in its own portfolio. 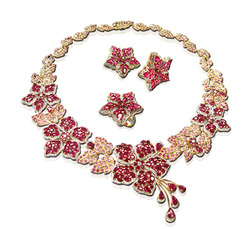 Luxurious parure in rubies and gold by Sphere Jewelry. Silver and gemstone parure by D.Quality Design. Sapphire and diamond parure by family-brand Duang Kaew. The crowd waiting to get badges on the opening day of the 56th BGJF. Thailand’s Prime Minister, General Prayuth Chan-ocha (center) is shown around the fair by GJPCT president Somchai Phornchindarak (right). A prominent jewelry manufacturer in Thailand, Pandora had a booth at the 56th Bangkok Gems & Jewelry Fair. Left to right: GJPCT president Somchai Phornchindarak; Pandora senior vice president John A. Murphy; Commerce Minister Apiradi Tantraporn; Nuntawan Sakuntanaga, director general of the Department of International Trade Promotion; and CEO of the Bangkok Gems & Jewelry Fair, Suttipong Damrongsakul. Among the more whimsical silver creations is an ant by Hong Factory. A winner in GIT’s Design Contest for young designers is this silver and gem brooch by Jittrakarn Bunterngpiboon. A suite of gemstone, enamel and gold-plated silver jewelry in the “Bird of Paradise” collection by Galassia. A special exhibition at the BGJF honoring Princess Maha Chakra Sirindhorn and her many charitable works on the occasion of her 60th birthday. A winner in GIT’s Design Contest for young designers is this silver and gem ring by Panushakorn Lertsinthawanont.